Injection moulding machine maker Engel Austria�s turnover for fiscal year 2011/2012 reached EUR834 million higher compared to last fiscal year�s EUR358 million. According to the company, two factors in particular have contributed to the upsurge � the introduction of the energy-saving Engel Ecodrive option and the consolidation of system solutions. To continue this growth, the company is building a new facility in Stuttgart, Germany, to better support its customers in the southwest of Germany. The facility will concentrate on innovations and the trends as well as act as an information and communications hub. According to the company, it will also invite clients to take part in technological forums and workshops on a regular basis. The main technological emphasis will be on aspects of lightweight construction, automation and energy efficiency. One staff member will be exclusively assigned to providing advice on energy to customers in southwest Germany. In other news, the company has just concluded its Engel HL Awards 2012. This year's prize winners leverage the benefits of tie-bar-less technology, mainly to achieve cost-efficiency in production. The HL Awards in Gold, Silver and Bronze went to Volkswagen in Wolfsburg, Germany; O.C.S.A. in Creazzo, Italy; and Anton in Zalaegerszeg, Hungary. The HL Awards are Engel�s acknowledgement of excellent applications with its tie-bar-less injection moulding machines. 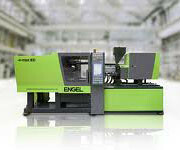 Engel introduced this technology to its victory series of machines more than 20 years ago.